PORTLAND, Ore. (June 12, 2018) – As part of the annual Pear Bureau Northwest (PBNW) meeting held in Portland, OR on May 31, industry members compiled the first official estimate of the 2018-19 fresh pear crop for Washington and Oregon. Pear growers and producers from Washington’s Wenatchee and Yakima districts and Oregon’s Mid-Columbia and Medford districts estimated this year’s fresh pear harvest at 18.9 million standard box equivalents, or approximately 415,000 tons of fresh pears. The estimate will mark an 18% increase from the 2017 harvest – an unusually small crop – and will be equal to the five-year average. Pick dates for the coming harvest are projected to be roughly a week earlier than last season, staying close to the historical average. Starkrimson are expected to be picked in early August, with the Bartlett harvest expected in mid-August. Anjou is expected to happen in late August in all districts while Bosc and Comice varieties will be harvested beginning in September and span through early October. Finally, Concorde, Forelle and Seckel will be picked in September and October across the four growing districts. Out of the leading varieties, the estimates for this season are 9.3 million standard boxes for Green Anjou (about 49.6% of total Northwest fresh pear crop), 4.6 million standard boxes of Bartlett (24% of the total crop), and 3.2 million Bosc (16.7% of the total crop). Red Anjou will represent 5.6% of the crop with a potential 1.1 million standard boxes. The Green Anjou crop is showing a projected increase of 10% compared to the smaller crop in 2017, but down 5% from a five-year average. Growers estimate that the Bartlett pear crop will be up 24% compared to last season, marking a 5% increase over a five-year average. The Bosc crop is estimated to be 42% higher than last season’s small crop and 8% above the five-year average, while Red Anjou production is expected to be 7% higher than last year and 5% above the five-year average. The organic pear estimate is expected to come in at 1.64 million standard boxes (36,000 metric tons), which is 8.7% of the total Northwest crop. Newly transitioned orchards and a strong pear crop overall have contributed to the growth in organic pears. Out of the entire organic crop, growers project 583,500 standard boxes of Green Anjou, with the Bartlett and Bosc crops sizes projected at 564,700 and 321,050 standard boxes, respectively. The PBNW meeting concluded with a strong industry commitment to continue to deliver exceptional and consistent eating quality for consumers, from the first Bartlett and Starkrimson to the last Green Anjou. “The industry is comprised of nearly 900 grower families, with 50 packing houses and over 25 sales organizations devoted to producing, packing and marketing the finest pears in the world with a taste profile that rivals any other product in the produce department,” reinforced Moffitt. Access a detailed copy of the estimate here. Photos approved for press can be viewed and downloaded here. 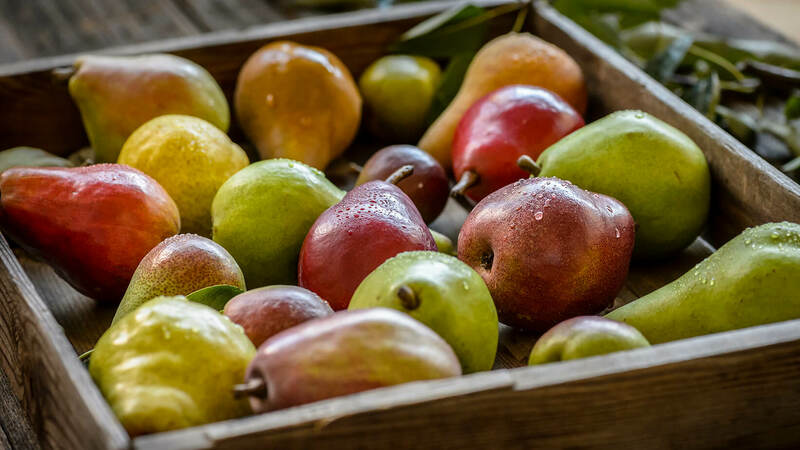 Across the U.S. and Canada, PBNW consumer outreach will focus on the many health benefits of eating pears and the delicious versatility of ripe, sweet, juicy pears from Washington and Oregon. Pears have the most fiber per serving (6 grams per medium-size pear) of the leading 20 fruits by sales in the produce department, and the importance of fiber on gut health, heart health and weight maintenance will top communications with consumers and nutrition influencers in 2018-19. To amplify key pear messaging, PBNW will be teaming up with actress Amy Smart, who will be starring as a celebrity spokesperson in a collection of pear-centric videos and other photos. This season PBNW will also be expanding omnichannel promotions with retailers, including program development with social media and supermarket dietitians as well as time honored support of displaying multiple varieties, display and training contests, and print and targeted digital ad promotions. Marketing communication will focus on a different theme for each part of the season that will begin with a spotlight on the hand-picked harvest from the four Northwest growing regions, telling the story of the grower, handler and communities that make the pear industry so unique. During the holidays, the theme will shift to the plentiful varieties of pears and inspiration for the table with dishes, cocktails and décor. Additionally, there will be a World Pear Day celebration on December 1 and National Pear Month promotions throughout December. Lastly, USA Pears will kick off the new year with a multi-month focus on the nutritional benefits that come from making pears a part of healthy diet. PBNW’s long-range planning for nutrition research will focus on the role pears play in gut health and health maintenance. The organization will continue to work with academic research community in to further understand the benefits of adding fresh pears to our diets, the core content of nutrition communication. The export market typically accounts for around 38% of the total sales in a given season including Mexico and Canada as the biggest markets, according to Global Trade Atlas. PBNW activities are conducted in nearly 30 countries worldwide by targeting both consumers and trade with the goal to create greater demand by increasing awareness on ripening, varieties, nutrition and usage. Activities in top markets for the 2018-19 season – Mexico, Central America, India, Middle East and Asia – will include in-store sampling, nutrition workshops, consumer advertising, movie promotional tie-ins, social media and event activations. To combat the increase in competition in many of the export markets, PBNW will look to conduct 1-2 month long promotion agreements with key retailers to increase shelf space, improve space location and put USA Pears on advertisements. In Mexico, the industry’s largest export market, PBNW uses its proprietary retail pear category data to identify the opportunities for new varieties, size and grades of Northwest pears with the major retailers. Larger scale special activities for the 2018-19 season include a 6-month long Luchador (Mexican wrestling) themed nutrition promotion for kids and families in Mexico, as well as Health/Nutritional seminars in India, UAE and Mexico. On December 1, PBNW will launch the 3rd Annual World Pear Day promotion – a global celebration of the pear that includes 24 hours of continuous sampling activities in each of PBNW’s export markets.